Presidents Hall is a new residence in the North Quad for 348 students designed to fit in seamlessly with its surrounding neighbors in both mass and detail. The unit types consist of a mix of traditional singles, doubles, and triples. Other program amenities include a first floor community floor lounge with an open kitchen concept, recreation area, and interior bike storage. The upper floors of the residential units are balanced with community-building floor lounges, studies and shared baths. Located north of McKie Baseball Field and adjacent Hahne and Hepburn Halls, the design challenge was to create a form that had synergy with its neighbors yet also create an intimate sense of residential community for a large bed count. 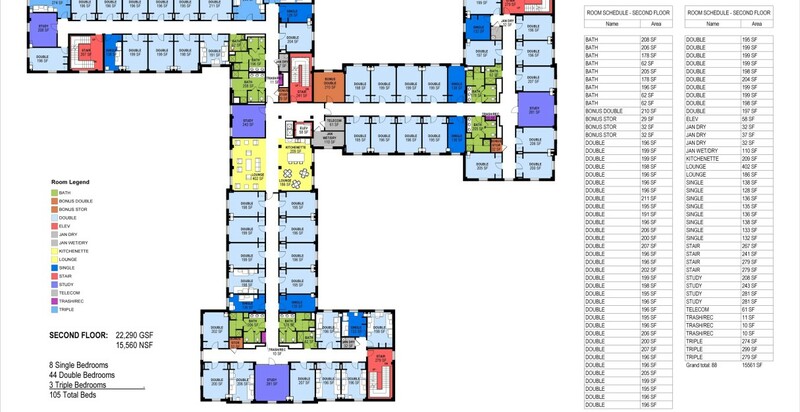 The floor plan was coined the “pinwheel” with each leg establishing a clear community of students with a central gathering floor lounge. The mass cascades down in height appearing to reduce the sheer size of the building. The building effortlessly nestles itself within the context of the organic nature of the North Quad and the elevations reflect the proportions and details of Miami University's Georgian Vernacular. 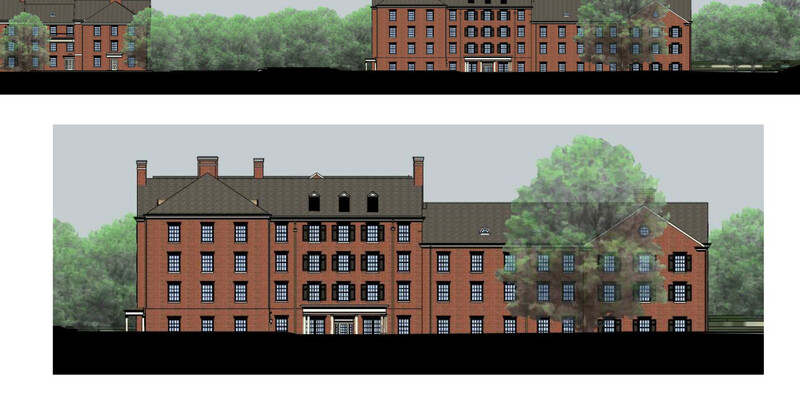 Presidents Hall, along with Withrow Hall, are two new buildings designed by Mackey Mitchell in the North Quad. In addition, MMA lead the design renovation of Martin Dining and the renovation of Flower, Brandon, and Hepburn Hall, and the renovation and a new addition on Hahne Hall. 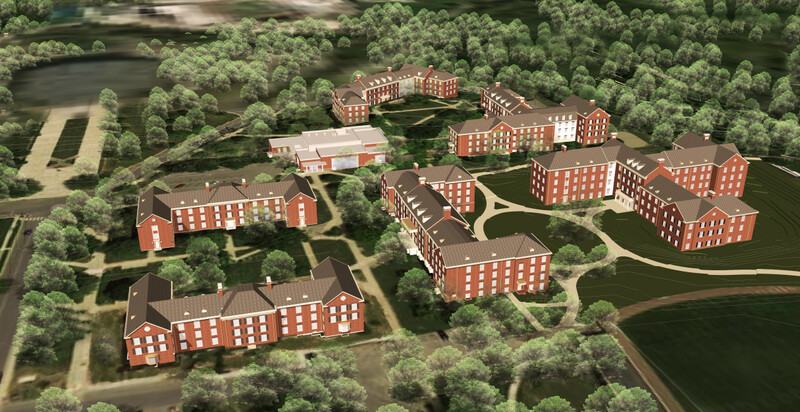 MMA is proud to be part of the exceptional design team charged with the residential transformation of the North Quad area of campus and we’re honored to be continuing our relationship with Miami University, which started in 2012 with the design of the Western Campus residence halls: Stonebridge, Beechwoods, and Hillcrest. The new building was designed to fit seamlessly into the existing Georgian vernacular of the North Quad. Plans were reviewed regularly for efficiency to ensure the best value and experience for the user. Throughout the design process interior renderings were created to review finish selections and discuss furniture layouts. Numerous elevations studies were reviewed to study scale and building details and proportions. 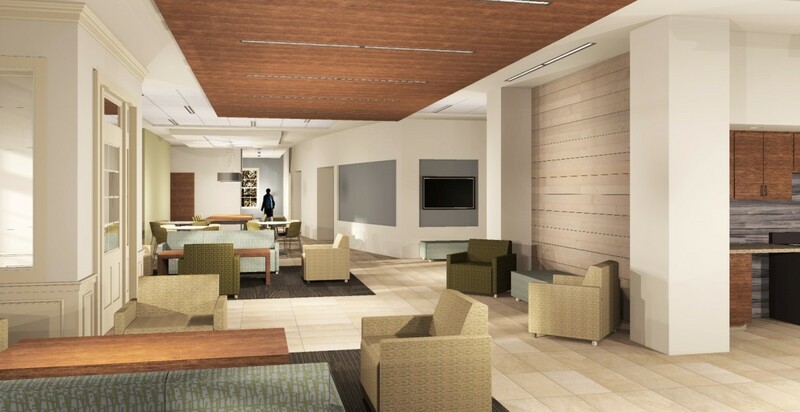 The design of the new Presidents Hall on the main campus extended the opportunity to be respectful of the strong Georgian architectural character while incorporating the many current tenants of a new residence hall.